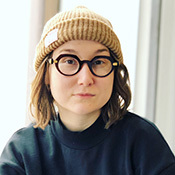 Ksenia M. Soboleva is an independent curator and PhD Candidate at the Institute of Fine Arts, NYU. She holds a BA in Art History from Utrecht University and an MA from the Institute of Fine Arts, NYU. Soboleva's dissertation focuses on lesbian artists and the AIDS crisis in New York, from 1981-1996. Her research interests include feminist and queer theory, the history of gender and sexuality, and performance studies.